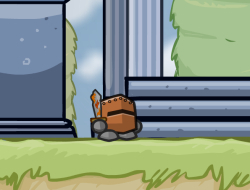 This is a fantasy adventure game in which you will play a Chibi Knight. There are lots of problems around the village and you will be the perfect candidate to kill all those that are threatening the security of the place. Also you will be able to learn a few spells due to your natural affinity to the mystical arts. Also you should try and get some levels early on into the game before you go outside in the wilderness. Make sure to visit the old witchman so he can teach you the first spell. When out of magic use your sword to kill the enemies. Use the arrow keys to move and A to attack, S to use spells. Chibi Knight 0.00 between 0 and 10 based on 0 votes.